Perhaps the decision between a real or fake Christmas tree was once a contentious matter for consumers. But today, it seems, the decision is becoming more and more clear-cut. Faux fir is decking our halls. 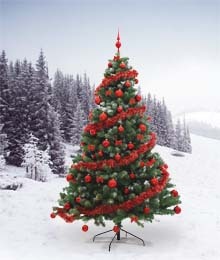 According to Statistics Canada, in 2011 the fresh-cut Christmas tree industry reaped more than $51 million in sales. Not bad, especially considering over $28 million came from exports (Canada is a net exporter of Christmas trees, StatsCan notes). In 2010, however, the industry raked in $56.6 million — that’s a 9 per cent drop. In fact, there’s been a significant slide in real Christmas tree sales over the last decade: down 22 per cent since 2006 and nearly a third since 2001. Artificial tree sales, on the other hand, continue to climb. Last year $47 million worth of fake Christmas trees were imported to Canada — more than double 2001’s figure — with the vast majority of those coming from China. Like virtually every other holiday hallmark, Canadian souvenir or bargain-priced paraphernalia that fetches our hard-earned cash, we’re importing Christmas from across the Pacific. The North Pole has moved its head office to Beijing.